Jacob Alan Rhame was born on March 16th, 1993 in Atlanta Georgia. He began his college career at the University of Oklahoma, pitching for the Sooners. But he gained nearly 60 pounds, lost his fastball & was cut from the team. He went to Grayson College then ended up at Texas State pitching for the Bobcats. 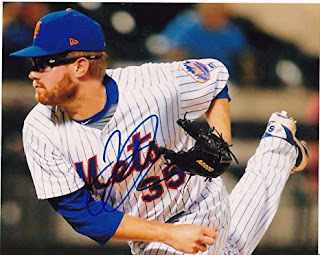 He was drafted by the Los Angeles Dodgers in the 6th round of the 2013 draft. He spent four years in the Dodgers organization, reaching AAA Oklahoma City in 2016 where he went 1-7. In August of 2017 he was sent to the Mets as the player to be named later in the Curtis Granderson trade. 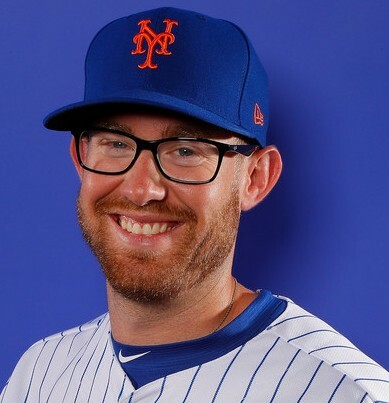 The pitcher wit the thick glasses, got onto the Mets staff as a September call up, debuting on September 2nd in a 6-5 loss to the Astros in Houston. On September 23rd, he gave up a 10th inning game winning HR to Daniel Murphy at Citi Field as the Nats won it 4-3. 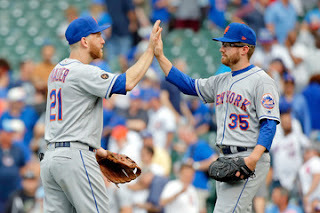 He closed out the year with a win at Philadelphia pitching two scoreless hitless innings (9-10). In 2018 he made the staff out of Spring Training, recording his first save on April 8th against the Nats in D.C. In May he suffered a loss & a blown save. By late summer, he saw regular action out of the pen, finishing up games in mop up rolls. On September 20th he earned his first win of the year, a two inning relief job against the Washington Nats on the road. In 2018 he appeared in 30 games, finishing up 15, going 1-2 with a 5.85 ERA, striking out 28 batters with 8 walks in 32.1 innings of work.